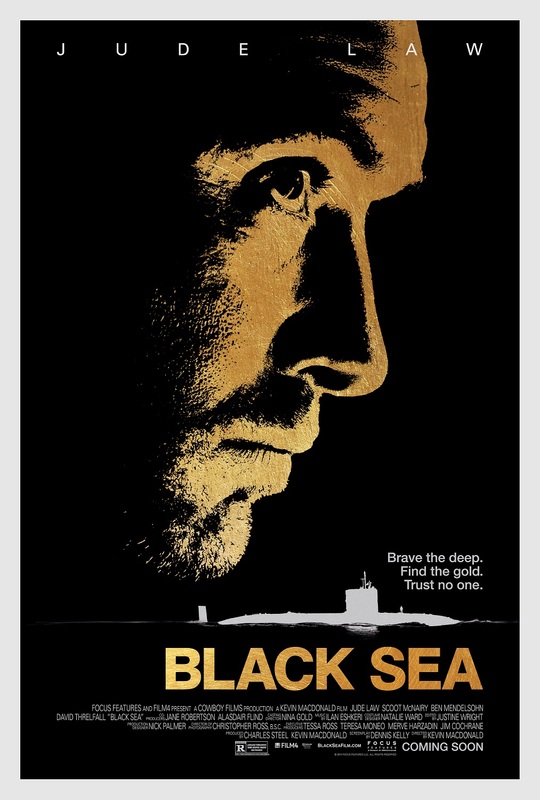 Director Kevin Macdonald’s Black Sea is a tense, edge of your seat thriller with a great cast and another stellar performance from Jude Law. The story focuses on Robinson (Law), a salvage expert who works with submarines and just got laid off from his job. He learns of a sunken Nazi submarine full of Soviet gold and has a good lead on its location. After finding a financial backer, he assembles a half-British, half-Russian crew to take a neutral sub down into the Black Sea to find the lost sub. The plan is to split the money equally, but the men begin to think that’s not too fair as some jobs on the ship are harder than others. This is something that Daniels (Scoot McNairy), the financier’s liaison, points out at the start of the voyage and his worst fears come to pass as paranoia and distrust form among the crew, especially their diver, Fraser (Ben Mendelsohn). His character arc is a little wonky—one of the small gripes I have with the film. But what ultimately results is a taut thriller with dangers from both within and without the submarine. One of the best things about Black Sea is how Macdonald creates the absolutely alien environment of deep sea diving. I felt like I was watching outtakes from Interstellar or Alien with how creepy and isolated the underwater environment appeared. He also does an excellent job with getting across how dangerous the mission is as well as creating a fantastically claustrophobic atmosphere in the sub. However, the film is not without its problems. There are some nagging plot holes that took me out of the film at times and I’m still scratching my head over right now. They aren’t enough to derail the whole film, but they definitely require you to suspend your disbelief a little more than expected. The cast does a topnotch job here with Law leading the way. He has been on a very quiet winning streak of late with great, great performances. It’s gotten to the point that if I hear Law is in a film, it automatically makes my list. McNairy is great as always and reminded me a lot of Paul Reiser’s character in Aliens. Fans of that film should know what to expect from Daniels in Black Sea. Mendelsohn also delivers a fantastic performance as the off-kilter Fraser. You never know which way he’s going to go and while that creates some strange character decisions later in the film, he’s probably the most compelling character in the piece. Grigoriy Dobrygin turns in a nice performance as Morozov, but I had some issues with a convenient reveal about his character halfway through the film. I also really enjoyed Konstantin Khabenskiy as Blackie, Robinson’s second-in-command. Overall, there are some minor issues throughout Black Sea, but it doesn’t change the fact that this is a great thriller. It has several different elements going for it: sub film, thriller, and heist film, with Macdonald pulling off the balancing act well. Check it out if you can find it in your area. This entry was posted in Reviews and tagged Ben Mendelsohn, Black Sea, Film Reviews, Films, Hodgepodge, Jude Law, Kevin Macdonald, Movie Reviews, Movies, Podcast, Scoot McNairy, submarine. Bookmark the permalink. Good review Doug. When Macdonald kept things tight and simple, it worked best. When he tried a bit too hard to twist things up, it got a little messy. Thanks Dan! Yeah, it wasn’t perfect, but way better than most of the offerings in January and February.